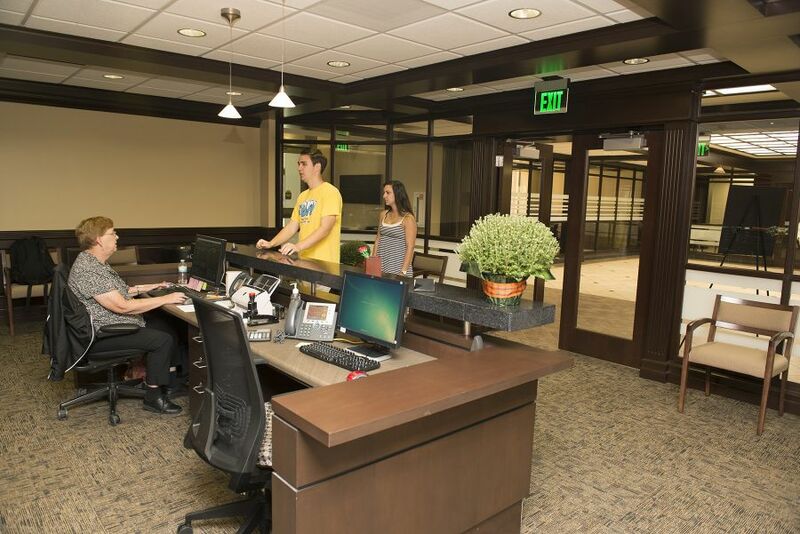 A look at the new Financial Aid Office inside Hovey Hall. Maybe you’re a peacemaker, are committed to HIV/AIDS care, or work at a restaurant near Eastland Mall. Or maybe you’re just tall. There’s a scholarship you should apply for. Illinois State University awarded more than $82.6 million in grants and scholarships last year, and Liz Larson from the Financial Aid Office works to match students with scholarship possibilities. It’s not always about GPA and leadership and service. Sometimes it’s just about how you roll. She sees a surprising number of students who get bowling scholarships. And then there’s Tall Clubs International, which offers scholarships to women who are at least 5-foot-10-inches tall, and men at least 6-foot-2-inches tall. Larson encourages students to set up a profile on Scholarship America, which serves as a clearinghouse for scholarships awarded by corporations and nonprofits. An anonymous donor established the Restaurant Service Scholarship to support students working as wait staff or host staff in full-service restaurants located near Eastland Mall in Bloomington. The M & M Scholarship isn’t what you think. It’s for males or racial minorities majoring in family and consumer sciences. The Financial Aid Office is now located in 101 Hovey Hall. Enrolled in a linguistic course? Check out The Grammie Scholarship, which rewards papers that feature the use of primary linguistic data, whether spoken data or textual, in the paper’s argument. The Dr. Brett Cassens Endowed Memorial Scholarship, which is named for an alum who was a pioneer in treating AIDS patients, is available to nursing majors, with a preference for LGBT students and/or students committed to HIV/AIDS care. The Rollings Scholarship was created in 2005 by Kaci Sue Rollings ’94, an elementary education teacher. It’s for education majors, with a preference given to single mothers under the age of 25. Students with a peace and conflict resolution minor should apply for the Grabill-Homan Peace Prize. It’s awarded to a student who has been involved with campus and community peacemaking activities. The award honors emeritus history professors Joseph Grabill and Gerlof Homan, who worked to create the interdisciplinary peace studies program. Business students who are working to pay for school should apply for the Ferengul Endowed Scholarship, established by Corey and Melanie Ferengul who grew up in working-class families and had to work several jobs during school breaks to pay for their education. The Friends of Donna Mauk Memorial Scholarship helps students who have lost a parent to cancer or are battling or survived cancer themselves. Mauk, who lost her battle with cancer, shared her life with an ISU grad, Steve Mauk ’79. If you’re a U.S. soldier or veteran, or the dependent of one, and are an entrepreneurship major or are studying abroad in France, look at the Dream Maker’s Endowed Scholarship named for David and Willie Mae Brown. He was a veteran of World War II and participated in D-Day on June 6, 1944.
International House students, particularly those from developing countries or emerging nations of Eastern Europe and Central Asia, should apply for the Marilyn M. Boyd Memorial Scholarship for International Students. Boyd served as program coordinator for the International House program for almost 25 years. Criminal justice sciences majors may qualify for the Reverend Martin Luther King Jr. Scholarship, established by the department. It’s awarded to students who can demonstrate how they worked in their communities in the spirit and teachings of King, and how they will use their education in criminal justice to further the ideals of social justice.